Ask Burnley fans of the mid to late 1960s about the Goal Machine and they will point you to a player from the North East by the name of John Murray, and yet in his time at Burnley he scored only six league goals plus four more in the League Cup. He had his time in the spotlight with the Clarets, it was short, and eventually after failing to establish himself in the first team he moved on and enjoyed a career that ended just short of 300 league appearances. 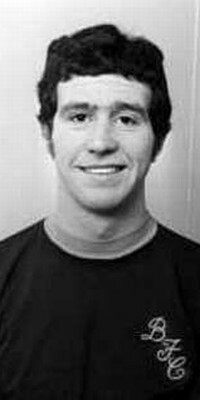 The Newcastle born Murray joined Burnley as an apprentice and signed his first professional forms on his 17th birthday in March 1965. As Burnley challenged for honours in the 1965/66 season the young Murray was doing his bit in the reserves and became a regular in the second string. It was in the following 1966/67 season that he first got his chance in the first team. He played generally on the left hand side and on 5th November 1966 made his debut in a 5-1 hammering at Leicester, replacing the injured Ralph Coates. The debut didn't lead to a rush of appearances but he did appear twice more in the first team that season, once as a substitute with little success and that led to a real struggle for him and he didn't once make the first team in the following season. That all changed during a few short weeks in October and November of 1968. He'd been in the first team earlier in the season but after a 4-0 home defeat against Liverpool manager Harry Potts made several changes for the next game at home to West Ham. By now Murray was playing as a centre forward and this was his first opportunity in the first team in his new position. He scored after just eight minutes as the Clarets beat the Hammers 3-1. That started a run of eight successive wins, six in the League and two in the League Cup. Murray scored in all but one of the six League games and added another three goals in the two cup ties. The only game in which he didn't score was a 1-0 home win against Ipswich when defender Colin Blant scored. Eight wins and eight goals for Murray and the nickname of Goal Machine was on everyone's lips. Still only 20, he looked to be the next big find and he was called up for the England Under-23 squad for a game against Holland at Birmingham, although he didn't play. Sadly it didn't last. Murray was soon out of the side again and made only thirteen league appearances all season. In the 1969/70 season he played just six times and scored the one goal, a penalty that started a comeback from 2-0 down against Sheffield Wednesday as we won 4-2. Before the end of that season, with Jimmy Adamson now in charge, he was sold to Blackpool for £10,000, but his stay on the coast was unsuccessful and he moved on less than a year later to Bury. There he started to score goals again and in just over three years he scored 37 league goals for the Shakers and that led to a move to Reading in a £4,000 transfer. He enjoyed success at Elm Park and was leading scorer as they won promotion. He was also top scorer in the following season even though that led to relegation. By 1978 he was struggling to keep his place in the Reading side and moved to Brentford. But he got just two starts in ten months and decided, at the age of 30 to retire from the game. He managed in non-league football and was a surprise name in the frame for the Burnley job when it was vacant in the 1990s. But John Murray will always be remembered as the Goal Machine in that side that had the whole country sitting up and taking notice as for two months we beat all before us. He might not have gone on to have a career at the top level, but he made one hell of an impact for those two months in 1968.